I would wait a few more days if not longer before everything is back up and running. It's likely that TWC is working diligently to try and restore the locals ASAP following last week's cyberattack but as Zach said, it will take a while for software to recover from such attacks. Checked this morning and the locals are out again, LDL and full-screen. It sounds like the ransomware attack really did damage to the software that produces the locals, given there's only been one LF that appeared since the hack. Hopefully this gets resolved soon if not later. General Weather Chat / Re: What's the weather in your area? 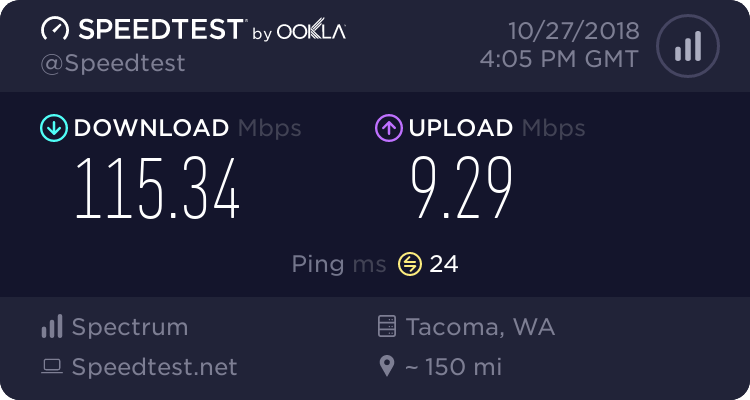 General Discussion / Re: What's Your Speedtest and Pingtest results? Spectrum did some upgrades in my area a while back, and this is honestly the fastest download speed I have seen thus far. I heard what sounded like an acoustic guitar instrumental on the 12:18AM ET LF. Don't know the name or artist, but I can confirm that it was NOT a track from either of the Smooth Jazz CDs. Maybe TWC is airing new songs? The emergency feed appeared for about 20-25 minutes during this hour. Honestly, I was expecting to see a lot more than some silly grayish LOT8s logo on the LDL (in place of the blue TWC logo) and leave almost everything else untouched, aside from the reduction of the number of LFs to just only two an hour. I guess TWC probably just needed the extra ad space. My Windows 10 laptop's desktop as of this moment. I shot that glorious photo of tonight's sunset from outside my house. Bought a Hauppauge WinTV-HVR-1955 tuner from Amazon for about $100. My old tuner, a Pinnacle PCTV HD USB stick, kicked the bucket. 52º light rain. Also had some thunder and lightning here within the last 15 minutes or so.